Low and high ropes courses have been in operation much longer than aerial adventure parks, so it’s not surprising that participants often refer to Tree to Tree Adventure Park as a ropes course. However, there are distinct differences between our aerial adventure park and a standard high ropes course. Aerial adventure parks like ours are specifically designed as an individual challenge, unlike a high ropes course that often focuses on team building. While Tree to Tree Adventure Park does offer team-building activities, these are separate activities. Our aerial adventure park has six levels that get more wobbly and higher up as you progress through the levels. Each element or challenge flows into the next as you transfer from one to another at platforms. Our park is also self-guided, with extensively trained guides monitoring your progress and available to assist only when necessary. Traditional high rope courses are typically used as a team-building tool for any group seeking common goals such as building trust, communication and teamwork between participants. Programs usually involve some activities on the ground and low and high ropes course challenges. Activities are structured as problem-solving exercises intended to explore the challenges individuals face within an organization and teach individuals to work together. While some elements may look similar, ropes course obstacles are typically built as standalone activities instead of individual parts of a whole. The safety equipment, particularly the belay system, is one of the biggest differentiating factors between aerial adventure parks and high ropes courses. The belay system in an aerial adventure park keeps participants attached to the components throughout the course. You’re also expected to operate your own belay system, which often includes a smart belay or dual-carabiner belay system that requires at least one carabiner to be attached at all times. Participants in a high ropes course are usually belayed from the ground with a dynamic belay that’s operated either by a facilitator or by colleagues within your group. Team belay systems require multiple participants to take responsibility for various aspects and often feed through a pulley-like system. 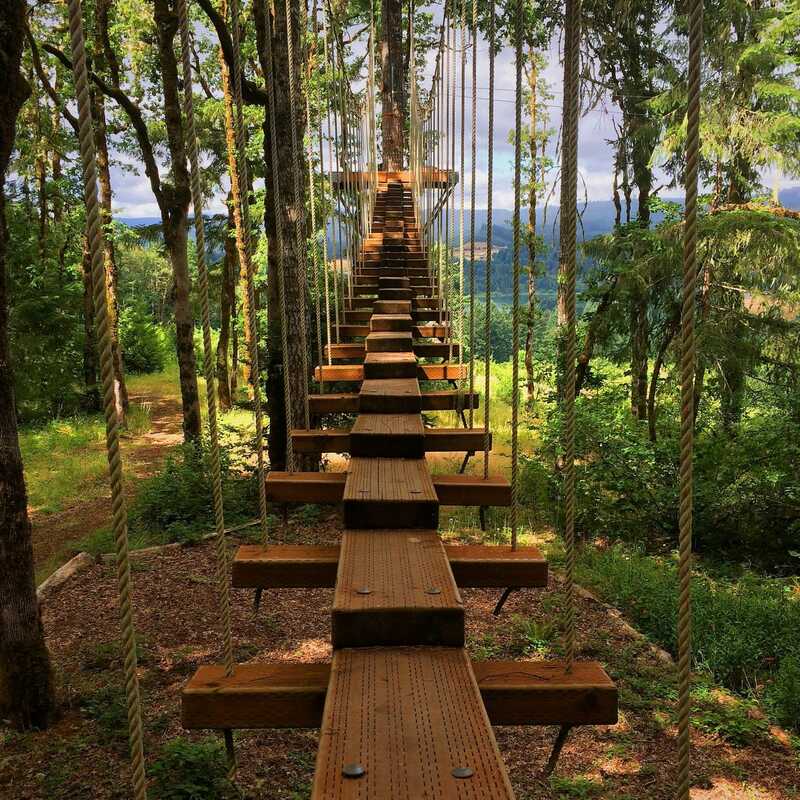 When you’re ready for an aerial adventure like no other, visit Tree to Tree Adventure Park in Gaston, Oregon. We’re open from March to mid-November and offer reservations on a first-come, first-served basis. Book online or contact us at (503) 357-0109 to make your reservations today.